Traditional earthquake early warning systems detect the fast-moving, but less-powerful P-waves that radiate from an earthquake. From there, they quickly estimate the earthquake’s location and magnitude and send out an alert, often just seconds before the more powerful S- waves arrive (check out the difference between the different waves here). But what does that alert mean for the building you’re currently in? It’s a question that Stefano Parolai, director of the Seismological Research Centre at the National Institute of Oceanography and Applied Geophysics (OGS) in Italy, works to answer. On-site early warning systems can also be tied to other safety mechanisms. For example, PG&E recently installed a system in the elevators of their downtown San Francisco office building. When a strong earthquake is detected, the elevators stop at the nearest floor and open, giving those inside a chance to reach a safer place before the shaking starts. Other systems include automatic shut-offs for pipelines or reactors. 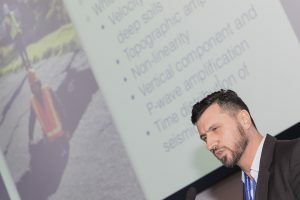 While on-site early warning systems are a popular topic in seismology – and one of Parolai’s primary research interests – he says their development requires a multidisciplinary approach. Over time, his interests broadened to seismic hazard and risk analysis. From there, early warning systems became a natural fit. From 2012 to 2017, he served as director of the Center for Early Warning Systems at the GFZ Potsdam in Germany. Parolai has had an active role in Europe’s earthquake early warning systems, including the REAKT (Strategies and tools for Real Time EArthquake RisK ReducTion) and SAFER (Seismic Early Warning for Europe) projects. The next step for these projects is making the systems more widespread, but Parolai explains there are still difficulties – including those beyond the scientific or technical realm. “When you’re dealing with early warning systems, you have to imagine that due to the impact the alarm can have, you’re not only dealing with scientific issues but also legal and governmental aspects,” he says. Going beyond the science is part of Parolai’s job. As director of research at OGS, he has to be both scientist and manager. Parolai also serves as general secretary for the European Seismological Commission, which is hosting its 36th General Assembly 2-7 September 2018. That goal may not yet be accessible for Parolai and his colleagues, but it’s not something that bothers him.